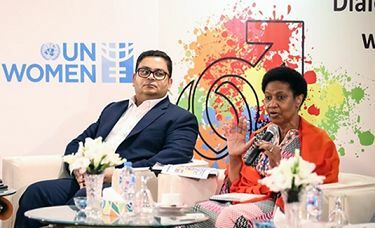 6th December 2018 marked an exciting day as the UN Womens global Executive Director, Phumzile Mlambo-Ngcuka visited Karachi to engage in a Dialogue on Gender Equality. This was hosted by UN Women in partnership with the Overseas Investors Chamber of Commerce and Industry (OICCI) and was attended by organizations from the private sector. P&G was invited to join the dialogue as a panellist. Sami Ahmed, Vice President P&G Pakistan, participated in the dialogue and shared key milestones achieved by the Company in its Gender Equality journey in the country. Ms. Phumzile Mlambo-Ngcuka stressed upon corporate leaders to be more proactive towards embracing gender equality in their operations and encouraged the private sector to promote policies to address human rights issues and economic issues. She shared about her journey with UN Women and reiterated the importance of the role corporate organizations can play in Pakistan to drive gender equality in the country. Mr. Sami Ahmed highlighted the Companys commitment to Gender Equality under P&Gs #WeSeeEqual umbrella and the companys holistic approach to achieving Gender Equality internally and externally. P&G remains committed to work towards the inclusion of women within its organization in Pakistan where women currently constitute around 35% of employees at the P&G Karachi General Office and around 40% of the P&G Pakistan Leadership Team. Through its brand and community programs P&G is helping remove gender-biased barriers for girls and creating economic opportunities for women. Programs such as Always #MyFutureStartsToday and Pantene #StrongIsBeautiful are inspiring Pakistani girls with confidence. P&G has also partnered with UN Women and HOPE for womens skill-development and girls education in the country. This program is expected to benefit an estimated 10,000 women and girls over a 3-year period in areas such as Sialkot, Badin, Sujawal, Thatta, Gadap, Ghagger and Muzaffargarh. The UN Women and OICCI initiative for Gender Equality has given a stronger voice and platform to this very important cause in the industry through engagement between corporate organizations, sharing of best practices and charting a roadmap for companies on women empowerment. P&G pledged to continue playing its part in furthering this cause in line with the Companys Gender Equality aspiration to build a world free from gender bias, with equal representation and an equal voice for women and men.